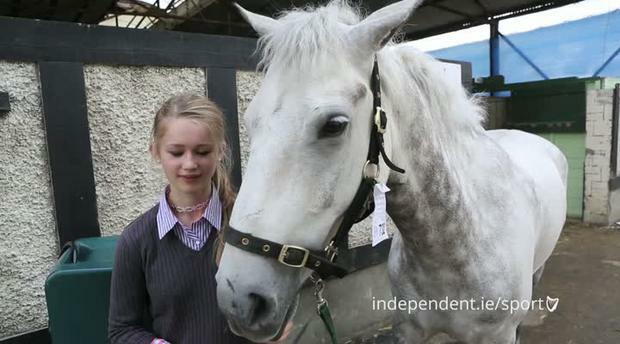 Independent.ie spoke to one of the young riders at the Dublin Horse Show about her loveable horse Felix. Laoise O' Farrell's horse is known by his 'stable name', Felix, but his competition name is 'Monologue Meteor'. "He's a character. He just tries his heart out". Although she admits owning a horse is a "full time job", she says the hard work is worth it. "Early mornings and late days... all go, all the time. But it's very sociable.. and good fun". Laoise qualified for the Pony Club Combine Training so the duo will be competing this weekend in both dressage and showjumping. "My favourite thing about Felix is his personality, he just loves people".